The St. Louis Cardinals beat the Chicago White Sox 1-0 on a night when, overall, pitching was the big story in MLB. Lance Lynn was the star of the game, but Marc Rzepczynski — yes, that Marc Rzepczynski — and Jason Motte played huge roles in assuring Lynn won his 10th game of the season. And Carlos Beltran continued to do what he’s done so well lately, providing the only run our Wolf Pup would need with a third-inning home run. It increased his NL-leading total to 19. Beltran also had two singles, and David Freese had one — for the grand total of Cards hits for the night. But that’s because Jake Peavy was pitching just as well as Lynn. It was vaguely reminiscent of the last 1-0 victory the Cardinals had, a certain game with two incredible pitching performance last October. Not the same importance, obviously, but terrific pitching all around. Wolf Pup had a career-high 12 strikeouts and started the game perfect through three innings. He allowed a lead-off single in the fourth before retiring the heart of the Sox lineup. Then came the fifth inning, the only trouble Lynn had all night. White Sox outfielder Alex Rios opened the inning with a triple to the wall in left-center field. The Cardinals led at the time and the White Sox had scores of possibilities to put a ball in play and tie the game. Lynn only needed one approach to keep the White Sox scoreless. He fed them a healthy dose of heat. Lynn dispatched A. J. Pierzynski with a 95-mph fastball for the first out. Shortstop Alexei Ramirez saw three pitches from Lynn, with “saw” being a generous verb. After getting ahead with an off-speed strike, Lynn fired back-to-back 95-mph fastballs to strike out Ramirez. An intentional walk to .197-hitting Orlando Hudson brought Peavy to the plate. He whiffed on a 94-mph fastball. After giving up a single to Orlando Hudson with one out in the eighth, Robin Ventura sent Adam Dunn — who sat out the game with a sprained ankle — up to pinch-hit. And Mike Matheny countered by removing Wolfie for … Marc Rzepczynski, much to everyone’s dismay. Same guy who gave up the towering homer to Dunn on Tuesday? Yep. On Tuesday, Rzepczynski allowed a one-run deficit to balloon to three and served up a monster home run on a slider to Dunn. This time, Rzepczynski threw three sinkers and garnered an inning-ending double play. He came off the mound visibly charged. And everyone breathed a huge sigh of relief. Then came the ninth and a little more intensity. Jason Motte was out there for the first time since Sunday’s loss, and tensions quickly increased dramatically. Two singles and a sacrifice meant the Sox had runners at first and third and the exact man they’d want up in a potentially game-winning situation: Paul Konerko. Yet Paulie (I listened to the Sox broadcast last night) did exactly what the Cardinals wanted him to do: hit a grounder to David Freese, who started the game-ending double play. And that was a winner! A very satisfying, very enjoyable winner — once our heart rates all returned to normal. Oh, and in case you were wondering about Shane Robinson’s mad dash off the field in the ninth — Mike Matheny said during the post-game he had lost a contact. Which, of course, was the last thing any of us were thinking at the time. 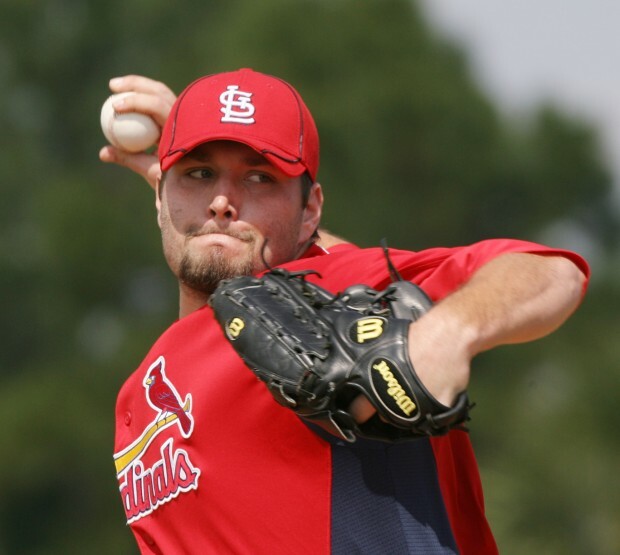 Speaking of pitchers duels and that game last October referenced above, great news yesterday: Chris Carpenter threw 26 pitches from the bullpen pitchers mound, the first time he’s done so since March. Continued success on your journey back, CC! And we’ll worry about whose spot you’ll take in the rotation when the time comes. I’ll admit, at the time I thought sending Rzep out to face Dunn was a terrible idea. Hind sight is 20/20, of course, but this morning I find myself loving what Matheny did last night. He took a stand — did something he knew Marc needed to get going — and took a risk on his guys. That kind of confidence surely doesn’t go unnoticed. It was a statement move, and (thankfully!) it paid off!